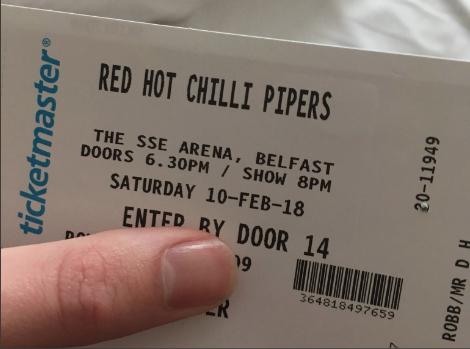 Duncan Robb thought he had planned the perfect Valentine’s getaway when he attempted to buy tickets to the Belfast gig of his girlfriend’s favourite band, the Red Hot Chilli Peppers. Except the band he had bought tickets for was not the Californian rock icons but the “most famous bagpipe band on the planet,” the Red Hot Chilli Pipers. After discovering the hilarious mixup on the morning of the concert on Feb. 10, the well-intentioned boyfriend shared his story in a now-viral tweet. Robb from Chesterfield, England, told Storyful that he came across the concert tickets while searching for some other tickets to a boxing match in the city. “When I clicked on and got tickets in row Q and for £30 [$41] each I thought what a bargain, there must not be many tickets left and snatched them up straight away. Also I saw the date was Feb 10, so I could make it into a Valentine’s Day weekend – kill two birds with one stone,” he said. Even though he gifted the tickets to his girlfriend on Christmas, “nobody,” including family members, noticed that the band was in fact the Chilli Pipers. It was not until three days before the concert that Robb’s girlfriend discovered the mistake. When looking up the supporting act for the band, she could not find any concert for the Red Hot Chilli Peppers in Belfast. “Hopefully we will get to see the real Chilli Peppers in the future,” Robb said.